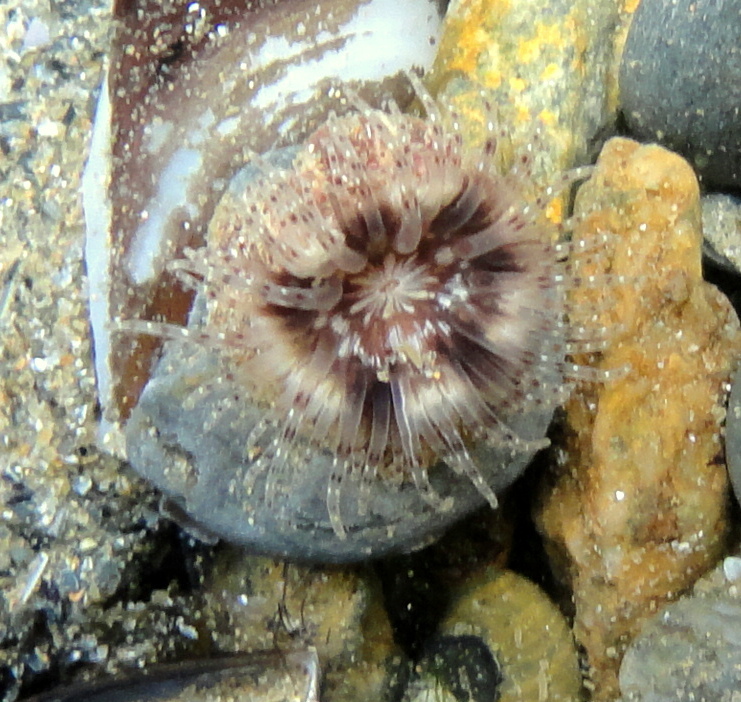 I should know by now that rock pooling can be surprising. As I wade through the pool formed where the river Lapic crosses the beach, a mini geyser of bubbles erupts under my wellies. All around bubbles are shooting up, releasing a pungent smell of methane and mud. It’s reminiscent of boiling mud pools in Iceland, but the cause isn’t volcanic this time. 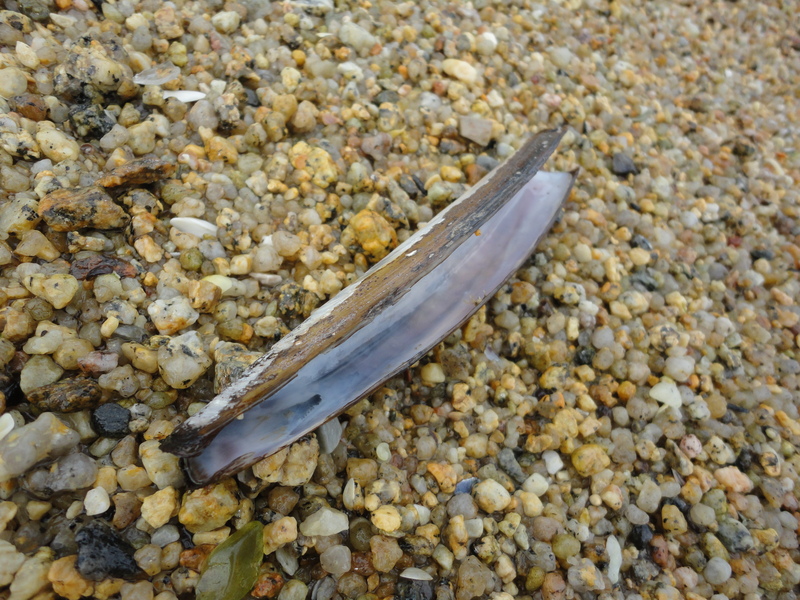 Somewhere below the surface, razor clams are darting downwards, away from my footsteps. The headland on the Trefeuntec side of the beach is made up of a low, stepped shelf of hard slate, providing plenty of gullies and pools, but fully exposed to the wind and waves of the Atlantic. As I approach I notice something unusual about the stone. It seems to be topped with sand, or pale rock. At close quarters, the rounded mounds enveloping the rocks are unmistakeable. They have a pattern of regular holes that resembles a giant bees nest, only these structures have been built by colonial worms and are made from sand. 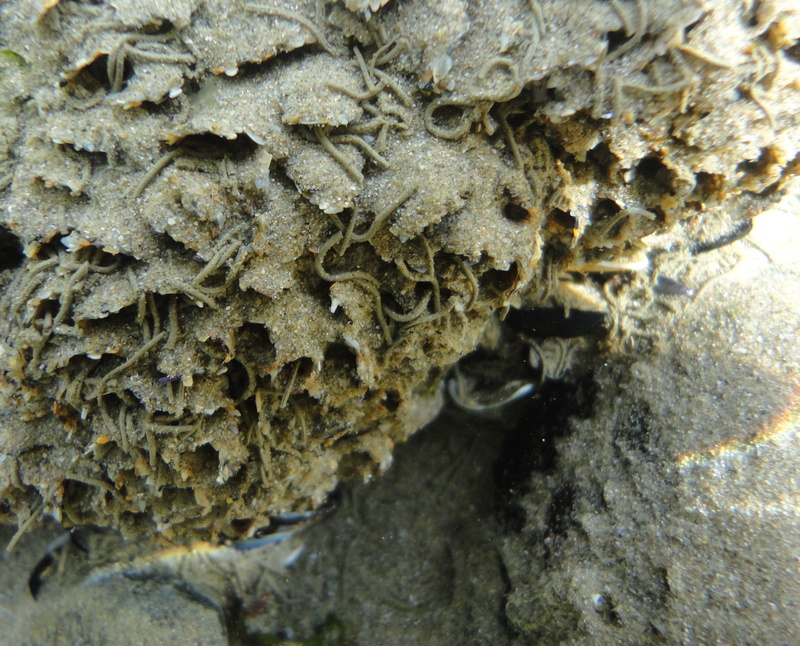 I’ve never seen this before, but I know instantly that I am looking at honeycomb worm reefs made by Sabellaria alveolata. 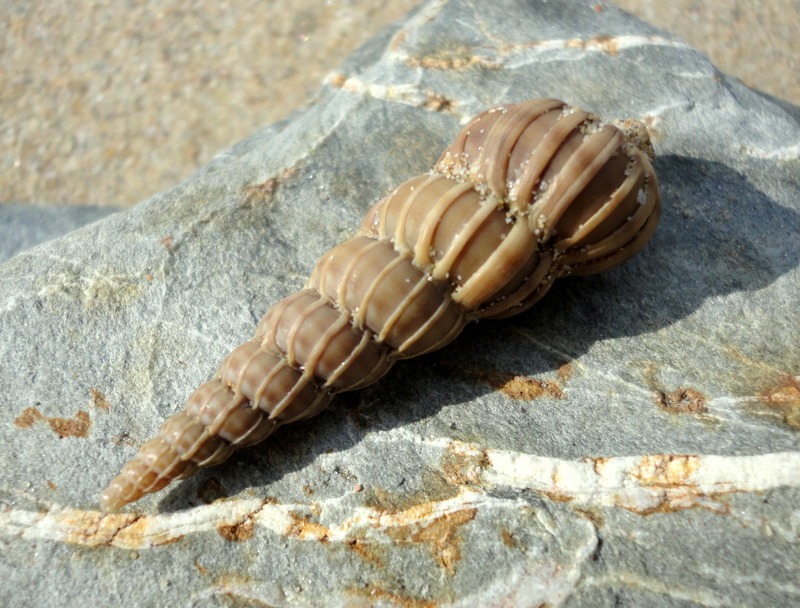 The honeycomb worm reefs are fragile – if you come across one, take great care not to disturb it. The structures are intricate and must be robust enough to stand great forces from the waves, yet they would crumble if I were to step on them. I tread carefully. Up close they are even more impressive. I can see every grain of sand. I try to picture each worm in there, building its tube, sticking each speck of stone or shell on with good old mucus. The openings are round rather than hexagonal and the animals work individually instead of sharing resources as in a bee hive, but they do all benefit from the protective structure of the reef. 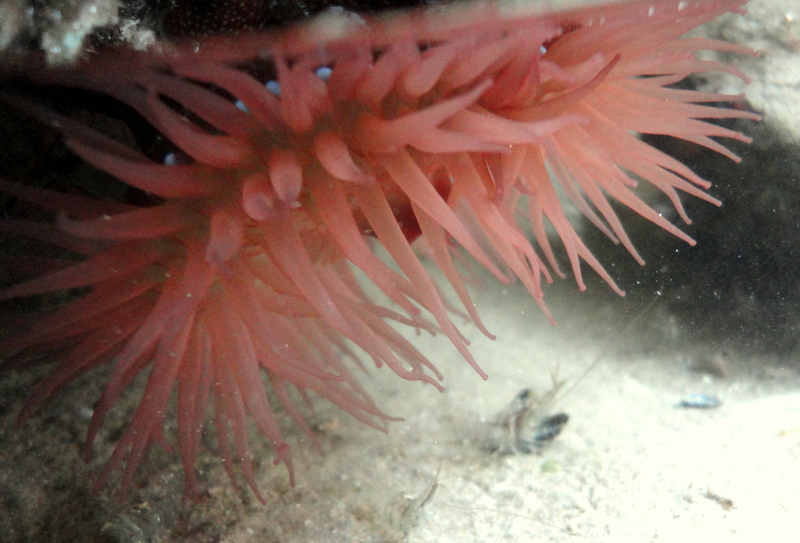 When the tide washes over them, they reach out with a white circle of feathery tentacles to filter passing nutrients. They love exposed conditions and need a constant supply of sand for their constructions. An underwater shot of the honeycomb worm reef. The animals will come out at high tide to feed. Other animals also benefit from the reef. I see mussels, snails and other small worms hiding among the sandy tubes. This is a whole habitat, unlike anything I have seen before. The rock pools here are anemone heaven. Every nook is packed with huge spreading strawberry and beadlet anemones and daisy anemones cluster on the pool bottom, interspersed with little gem anemones. 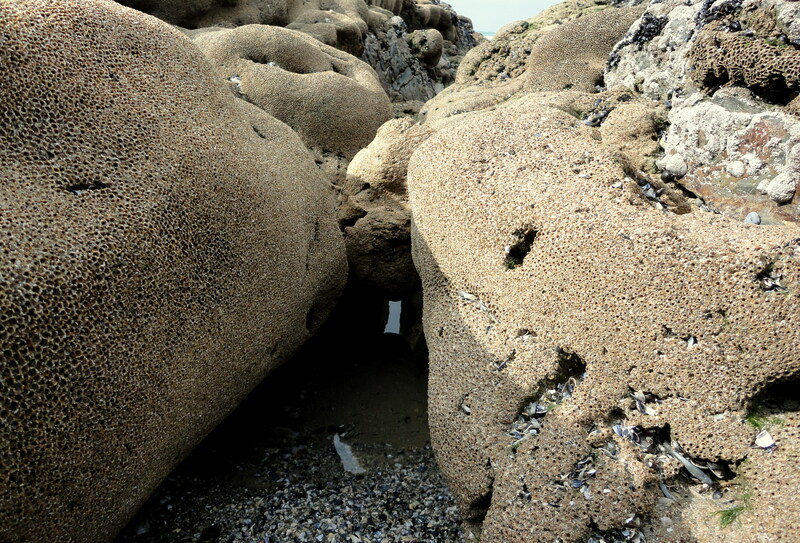 Syphons of clams disappear into the sediment as I approach and occasional crabs stare out from deeper holes in the rock. I photograph a tiny, striking anemone, possibly a sargatia sp. attached to a rock fragment in a deep pool, its tentacles a mass of pink spots, framing its marbled centre. Anemone (poss sargatia sp) on a pebble. 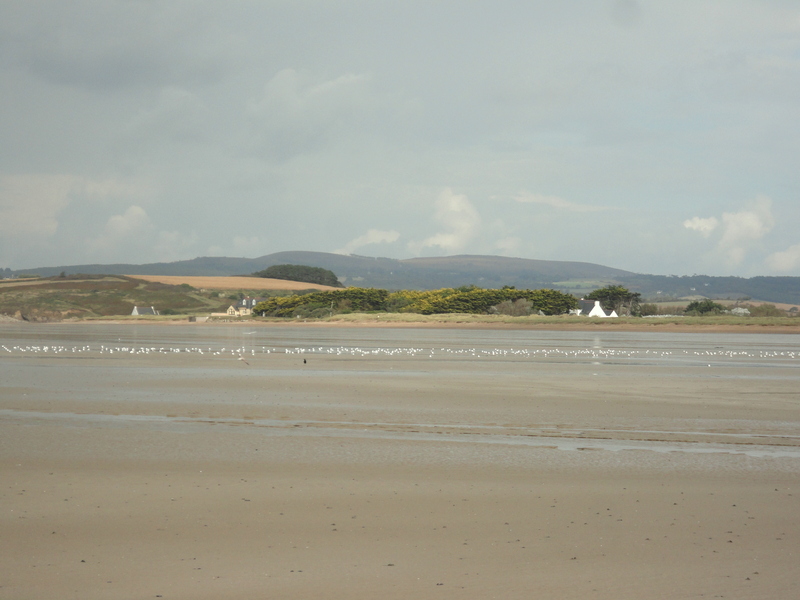 I rush back before the tide washes in to tell the boys about my finds. 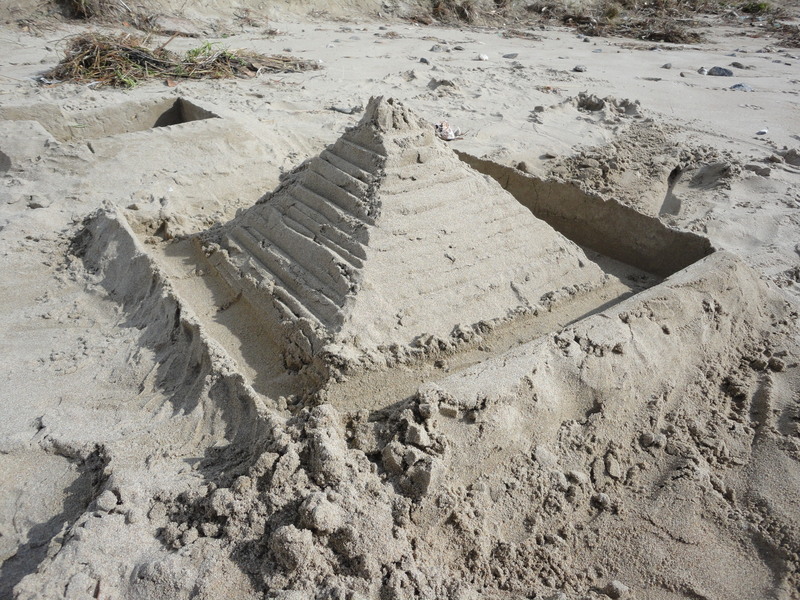 They are engrossed in their own sand constructions: a castle and pyramid complex decorated with dog cockles. I join the castle invasion team while Ed visits the honeycomb worm reef. The sun is mellow even with autumn round the corner. I wonder when I will reach the stage where I have done so much rockpooling that there’s nothing new to see. With thirty years already under my (tightening) belt, I’m pretty sure the answer is never. Am loving your blogs, so informative and interesting. You obviously love life in the rockpools! Thanks for your lovely comment, Pat. The rock pools are amazing. There’s always something new and these worm reefs took my breath away. Thanks again for reading. 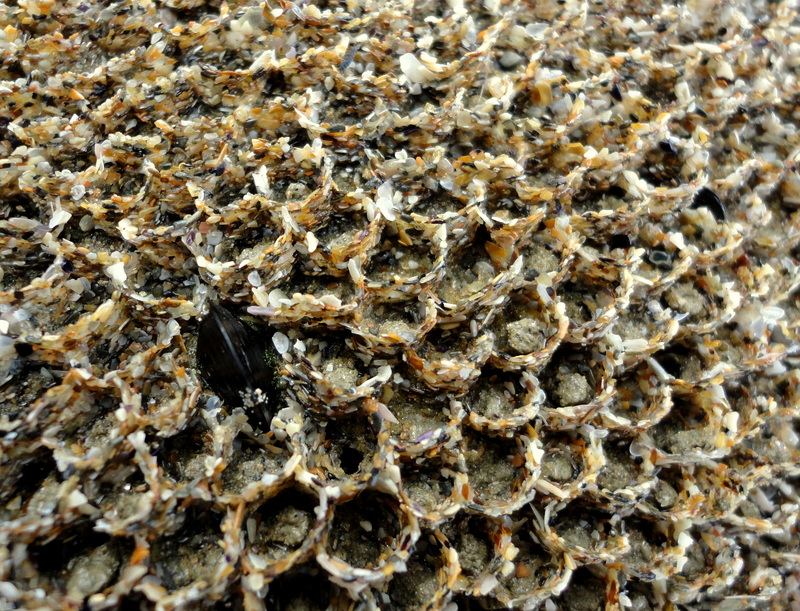 We went tidepooling for the first time in Santa Cruz, CA and came across some amazing worm honeycomb. I was so intrigued I had to learn more. So glad I found your blog. Here’s to more exploring with my toddler.